Portland abounds in natural beauty, and visitors can expect spectacular views of wildlife, flora and fauna. Nearly 300 species of birds and over 750 species of butterflies and moths have been recorded. 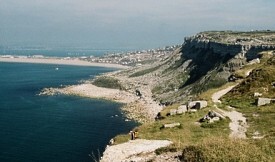 Joined to the mainland of Weymouth by Chesil Beach and a road bridge, the isle is somewhat secluded. Places to visit include Portland Castle, built in 1540, and several lighthouses.